What a pity the founding members of the new Gay Book Club didn't think to use a correctly placed hyphen--if they had, things might have worked out for everyone very differently indeed. Rory McGrath suffers from a debilitating condition--he caught it from reading too many books. Rory believes in true love. He's saving himself until he finds it, preferably with Mr Darcy, but definitely not with the arrogant, unpleasant ape Adam Sandstone. Adam isn't impressed with Rory either. Both Rory and Adam have yet to learn, however, that you cannot always judge a book by its cover. The nine other members of the new club could have told them this, had they been consulted. 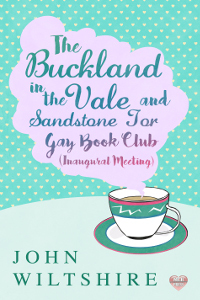 The founders of the Buckland-in-the-Vale and Sandstone Tor Gay Book Club know only too well that not all truths are written in books. Truth, like life, is what you make of it.